Nearly thirty years into his career, George Mason has hit his stride. Though he received his training in ceramics at New York State College of Ceramics, where he specialized in architectural ceramic tile, his most recent body of work departs from the medium he has traditionally used. 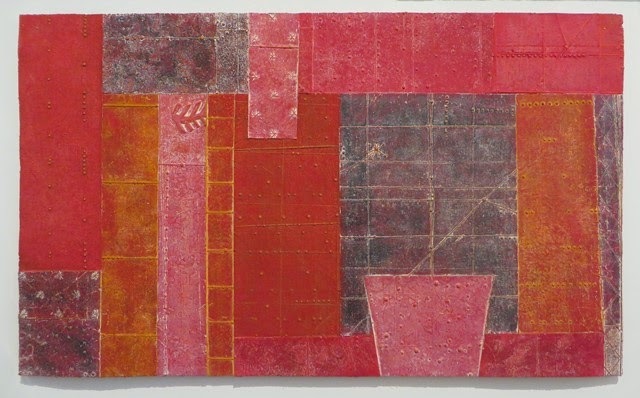 Floating about one inch from the wall, his unframed paneled hangings, which he dubs “relief tapestries,” are composed of hydrocal plaster, burlap, casein paint, and encaustic. Mason works his surfaces to create low relief, carving them, burnishing them, and adding pigment and encaustic to underscore the variety in his patterns. His boldly textured surfaces combined with tighter color palettes and a clean display feel simultaneously ancient and contemporary, minimal and subtly complex. Mason’s panels are most successful when he omits pictorial hieroglyphics from them. His less graphic markings still invite the viewer to “read” the pieces close up, but they don’t nod obviously to written languages of ancient civilizations. The mystery of trying to decode a visual language without an overt reference adds another layer of interest to Mason’s work. The gestalt of the pieces assembled from texturally varied, asymmetrical strips evokes reverence in the viewer who sees them. Mason was invited early in his career to participate in group exhibitions at Bezalel Academy of Arts and Design in Jerusalem and at the 13th Chunichi International Exhibition of Ceramic Arts in Nagoya, Japan. 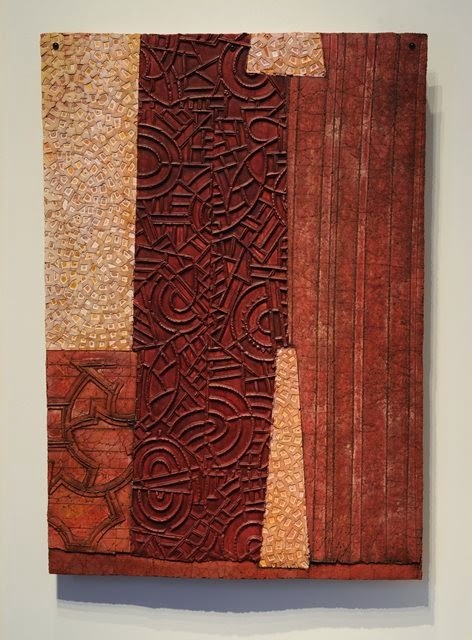 While teaching in India, Indonesia, and Jerusalem, he began experimenting with encaustics and layered paper cutouts. His absorption of many countries’ visual cultures has led him to focus his most recent artistic exploration on a central question: “Is it possible to create large dimensional works, outside the frame, highly textural, referencing textile, ceramic, and cut out traditions, that hang with authority yet surrender to gravity with grace?” Upon viewing his Wedge series in person, our unequivocal answer is yes.